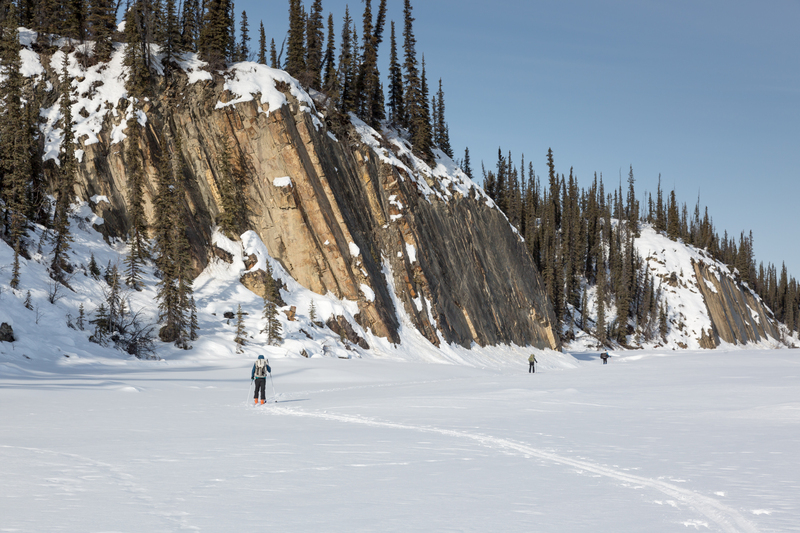 2018 was the third and final year of the Alaska Mountain Wilderness Ski Classic in the Brooks Range (it will likely be back in the Brooks from 2022-2024). 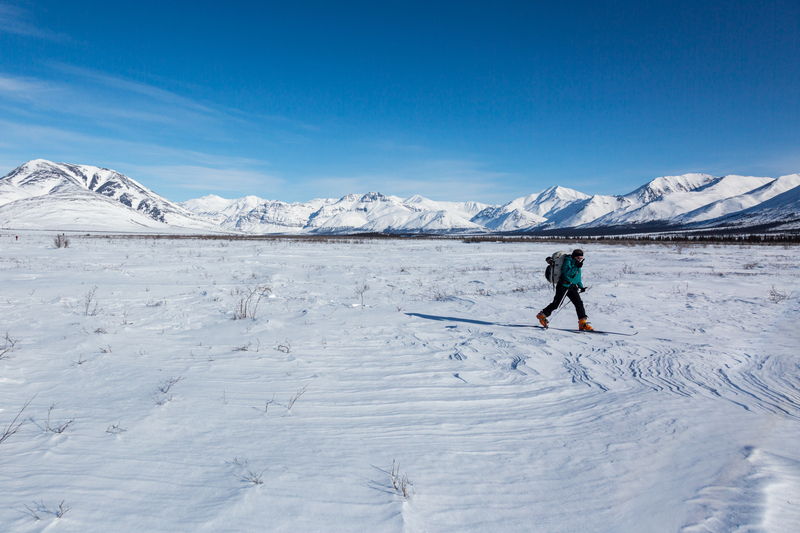 I missed the opportunity to travel through the Arctic National Wildlife Refuge on the course last year, so committed early to the AMWSC this year. Last year’s route sounded tough, Katie Strong’s trip report makes it a candidate for the hardest winter classic ever. After 6 winter classics in a row, then missing 4, I was nervous coming out of retirement for a hard route. 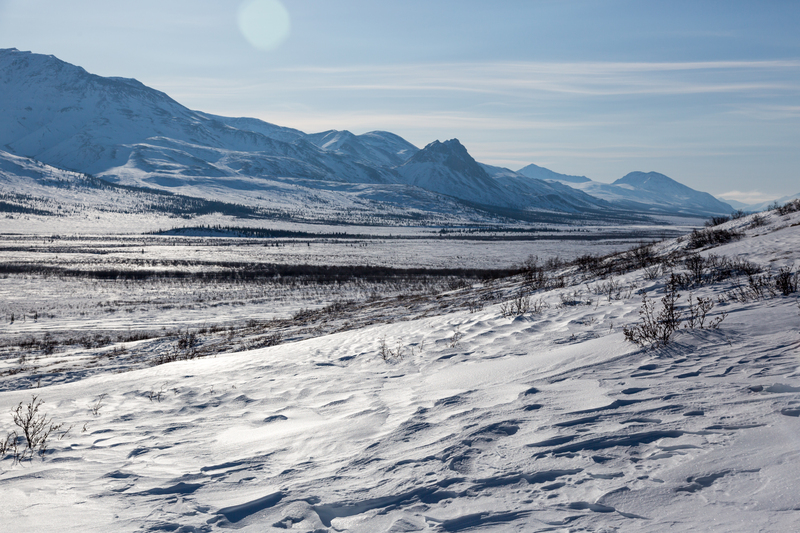 But after traveling through the Arctic Refuge with Sarah last summer, I wanted to see it in the winter. 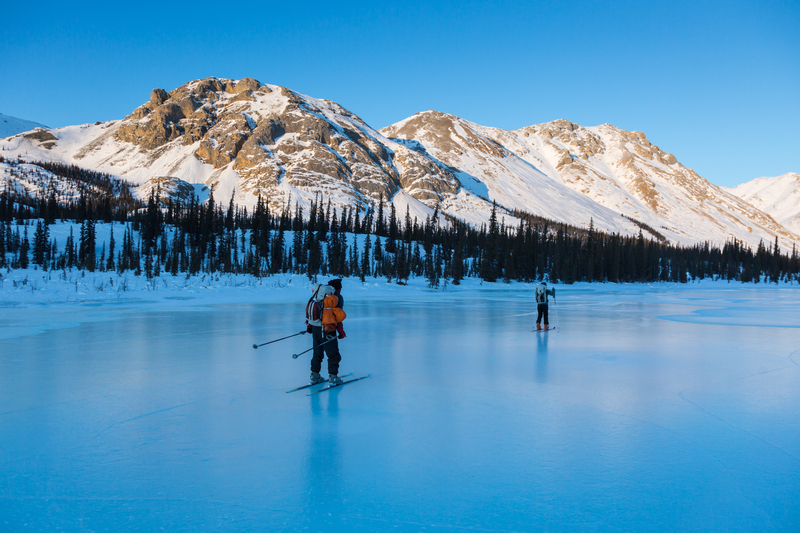 I trained more than ever before, putting on weight and 100 miles on my Classic skis in the month before driving to Wiseman for the warm welcome from Uta, Bernie, Julia, and Leo Hicker, Arctic Getaway B&B. 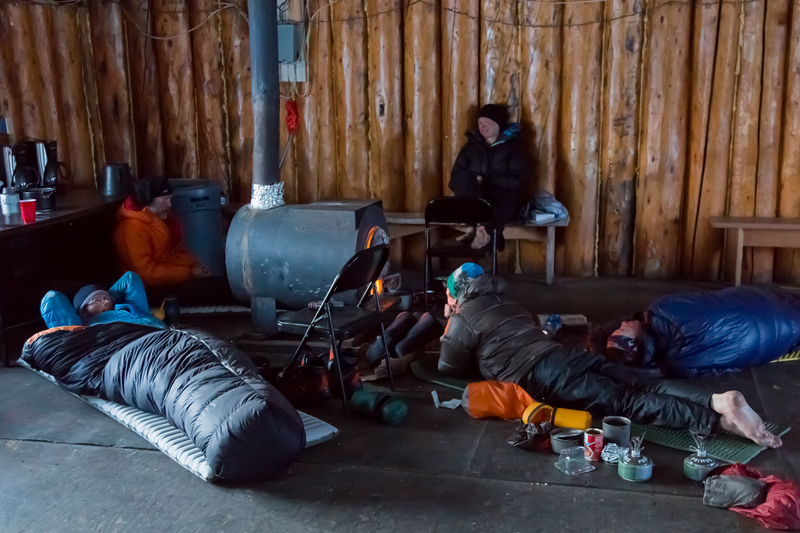 After an evening of stories, gear preparation, last-minute decisions, and Happy Birthday wishes for Dave Cramer, Josh Mumm, and Bobby Gillis, everyone settled in for the final warm night of the week. Sunday morning we drove north from Wiseman, leaving mild temperatures for blowing snow and a brief road closure. The start was efficient, everyone huddled against the wind and ready to start moving. 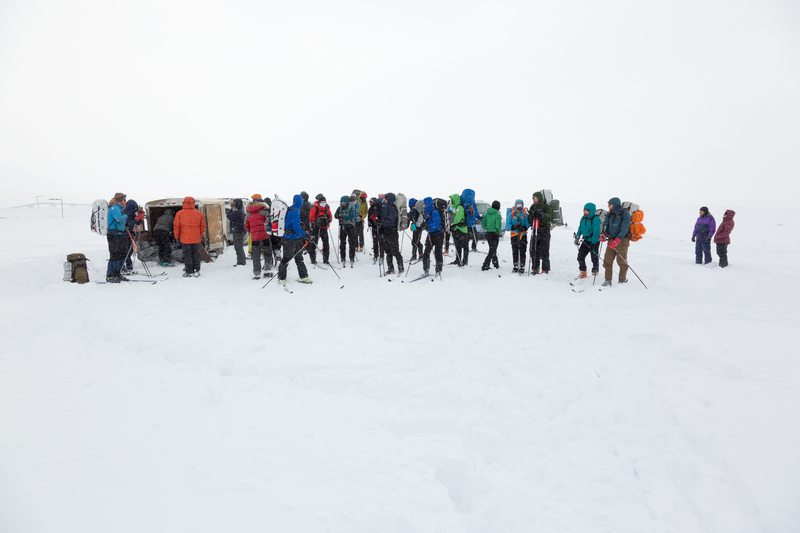 20 people started the course on the Refuge side of the Dalton Highway, and 13(?) opted for slightly shorter options on the Gates side. Travel was slow down Atigun Gorge, with skiers stacked up against whoever was breaking trail, typically Chuck Lindsay. 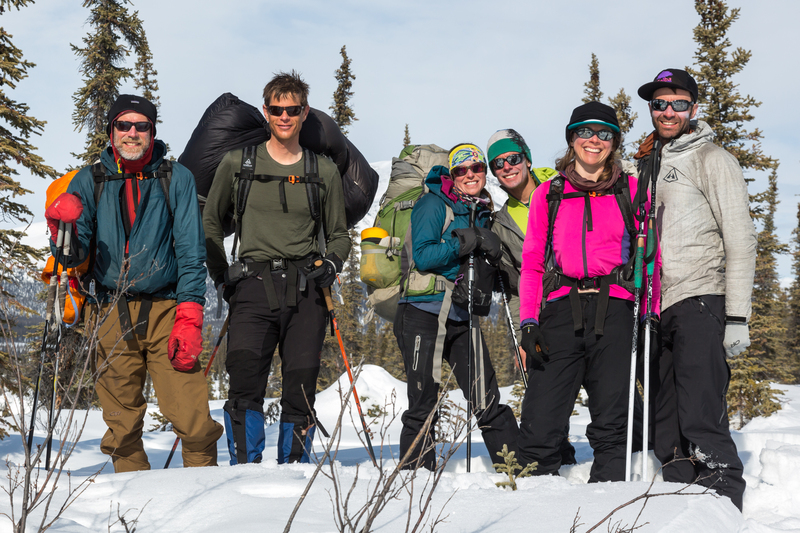 I dubbed this part of the trip “Chilkoot Chuck and the Notorious Nineteen.” The group began to space out as we approached the ‘shortcut,’ a choked pass to the Accomplishment Creek drainage, more direct than the less exposed option to the north. Around 9 pm Sarah and I started looking for a camp spot at the entrance of the shortcut. Sarah broke through a patch of overflow and soaked her boots and gloves, so we kept moving, trying to use body heat to drive water off of her. Before too long we settled in for a cold night (-15 F?) tucked up against a small windbreak. 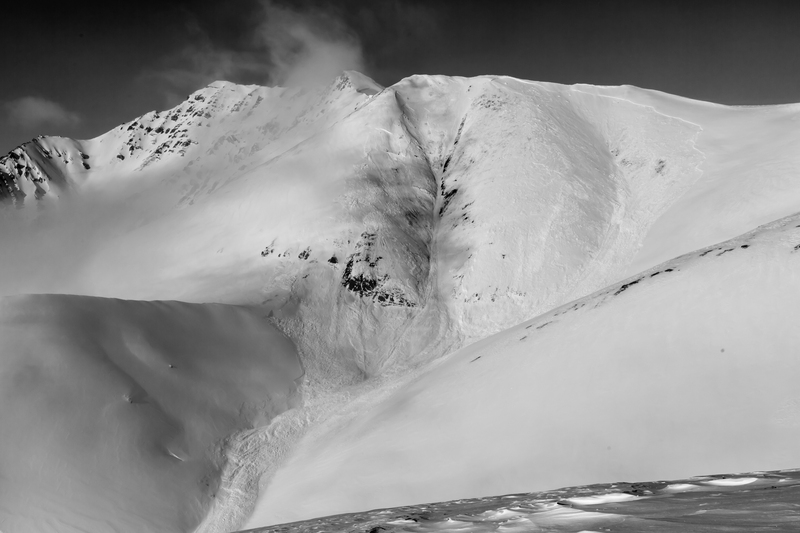 The shortcut had several avalanche debris piles and crowns, three of which looked very fresh. People came back from the 2017 course pretty spooked by stability conditions, so we noticed these natural slides and started discussing sections on the course that would need extra attention. 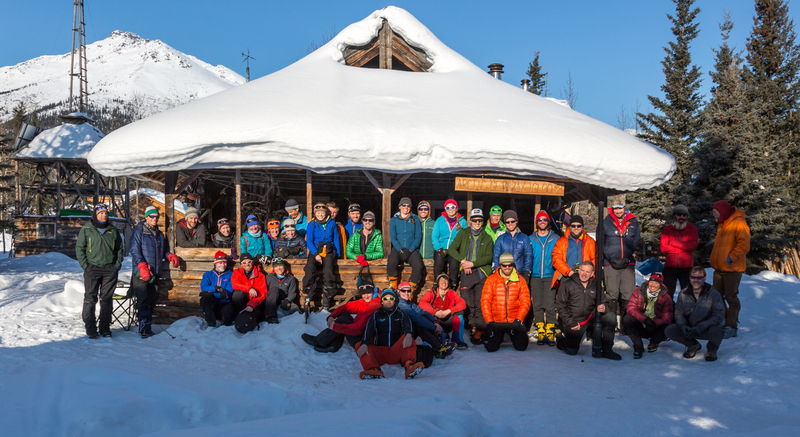 The ski up Accomplishment Creek was sunny and uneventful. We leap-frogged with friends/couples Katie Strong & Jonathan Rupp, and Eben Sargent & Natalie Dawson. As we started the descent from Accomplishment Pass, we followed tracks down a gully that quickly turned right for a rock field. The entrance to the gully had cracked and slid several inches, but not released a full slide. 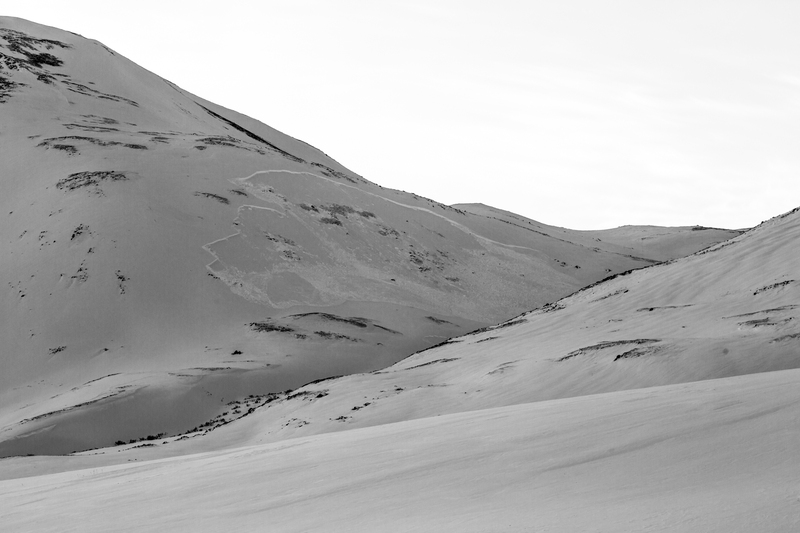 We followed the escape tracks and booted down a slope to more gentle terrain. Soon we noticed more fresh debris, and speculated that the group of trailbreakers in front of us, Chuck, Toby, Josh, and Jack, had remotely triggered the slide. We didn’t get the full story until we caught the group on the other side of Accomplishment Pass. Chuck, Toby, and Josh had skied down the gully and were filling water at a natural seep when they saw a large slide (photo below) over where they had just skied. 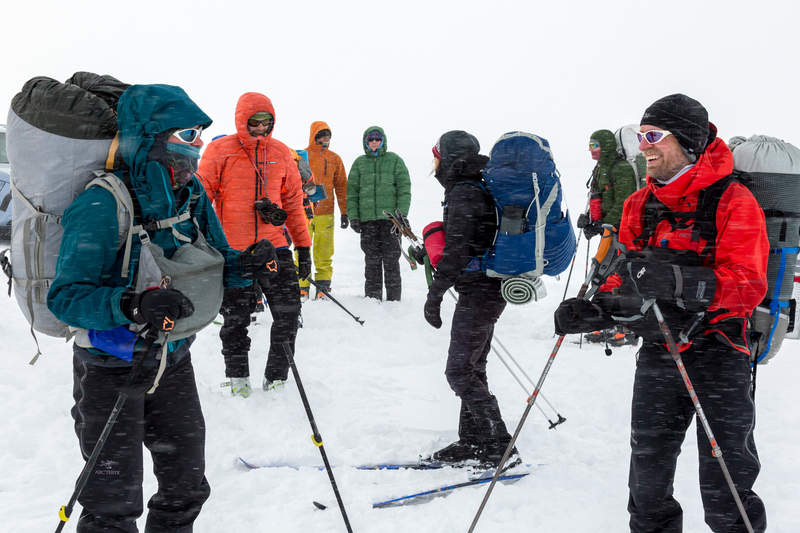 They grabbed their avy gear and skied back up the gully, expecting the worst for Jack, who did not have an avalanche transceiver (of all the participants, only Chuck, Toby, and Josh had avy gear, because they anticipated taking a more exposed route). Jack had triggered the slide at a small roll-over, been knocked off his feet, but not buried. If he had triggered the slide below the open face, it is unlikely that he would have survived. The group of trailbreakers was pretty rattled, especially Jack, who was somewhat in shock. 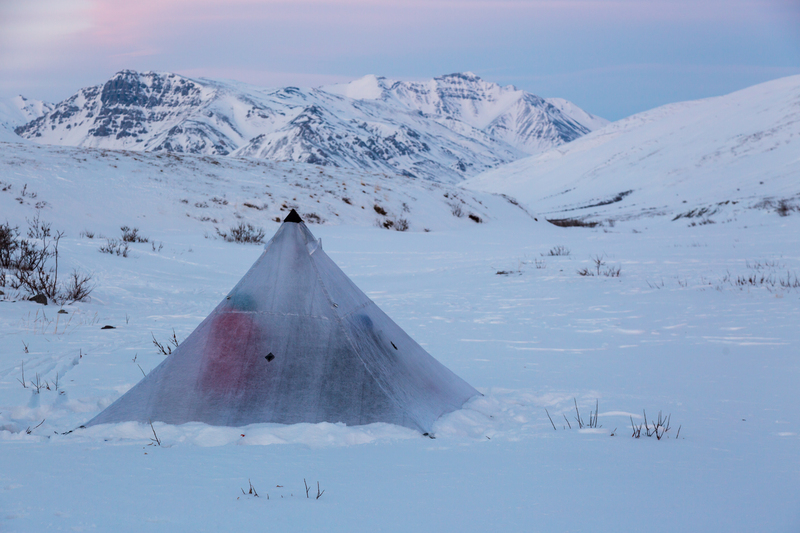 They travelled down valley a short distance to the first wind break, camped, and started discussing bailout options. Most of the rest of the skiers caught up later in the evening. 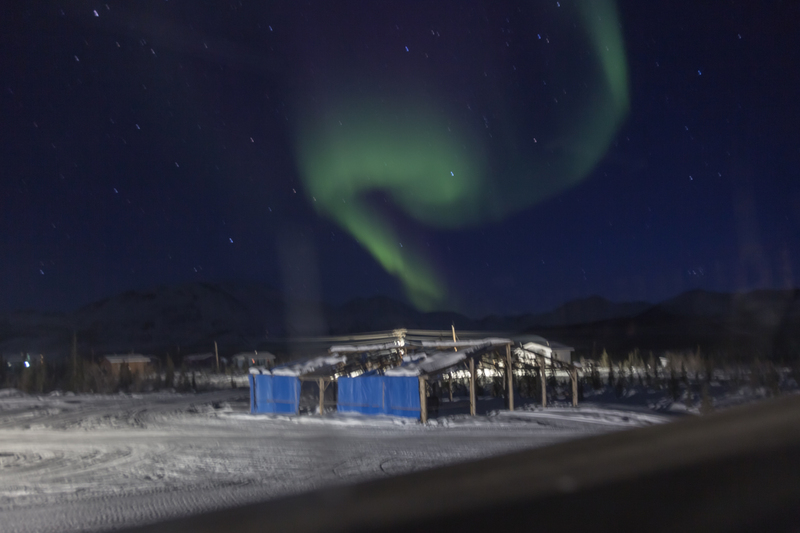 Around 9 PM we were buzzed by a helicopter, North Slope Borough Search and Rescue. My first thought was that someone behind us saw the avalanche debris and thought someone might be buried. Second thought was that a group behind us had triggered another slide. Third thought was that someone’s inReach sent a false SOS, a fairly common problem due to a defective locking mechanism. It turned out to be an inReach false SOS. Fortunately NSBSAR didn’t charge for the flight, but that is not always the case. The obvious bailout options were to turn back the way we had come, or head down valley to the Ribdon River, making a ~loop to return to the Dalton. 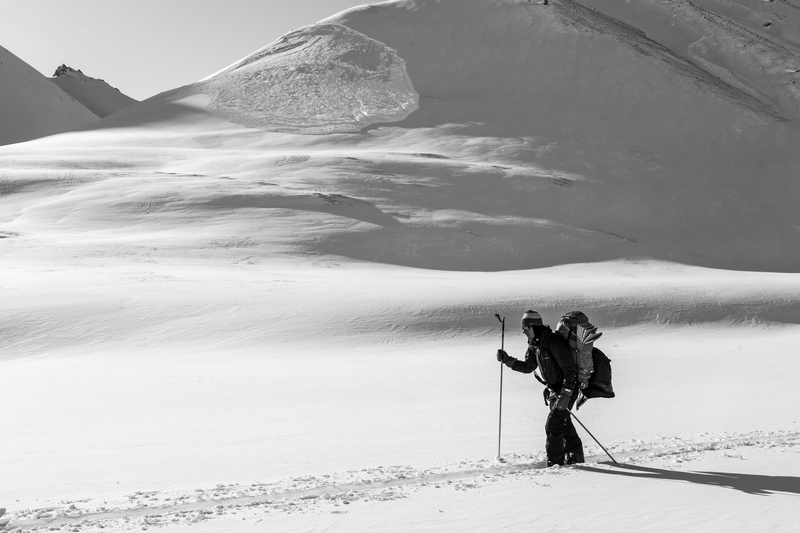 Continuing on the Classic route to the checkpoint and Wiseman meant crossing the continental divide in 10 miles, an easy approach, but the backside of the pass was likely to have unstable snow, as was the case in 2017. I wanted to at least see the divide, so Sarah and I woke up early to break trail. Chuck, Josh, Eben, and Natalie caught us later in the day, while the other 14 skiers returned to the highway via one of the bailout routes. 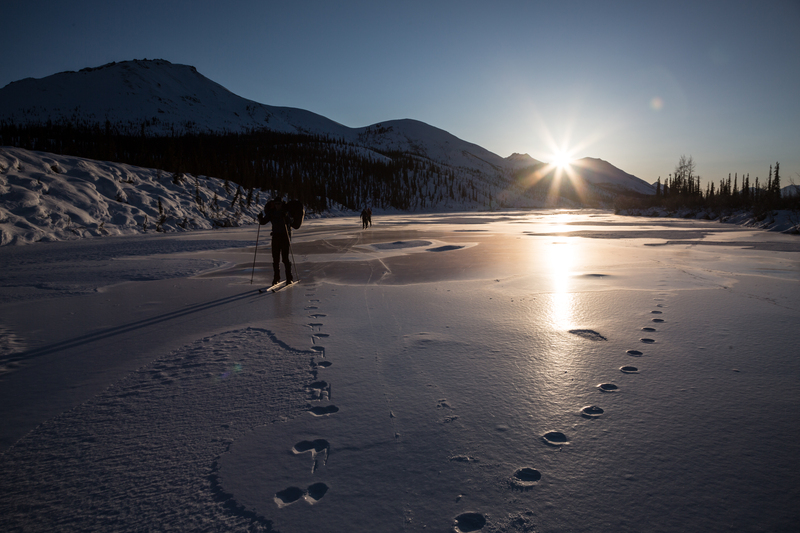 At the divide, we scouted options for getting to the valley floor without exposing ourselves to unstable slopes. We were able to boot up a rocky ridge, over a summit, and down a low angle rocky ramp to a low angle apron that reached the valley floor. 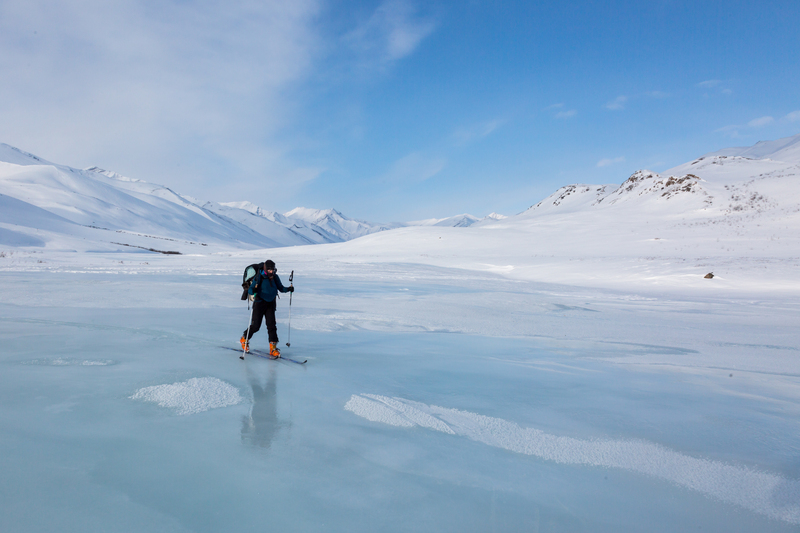 The valley floor welcomed us with deep depth hoar, slow progress. 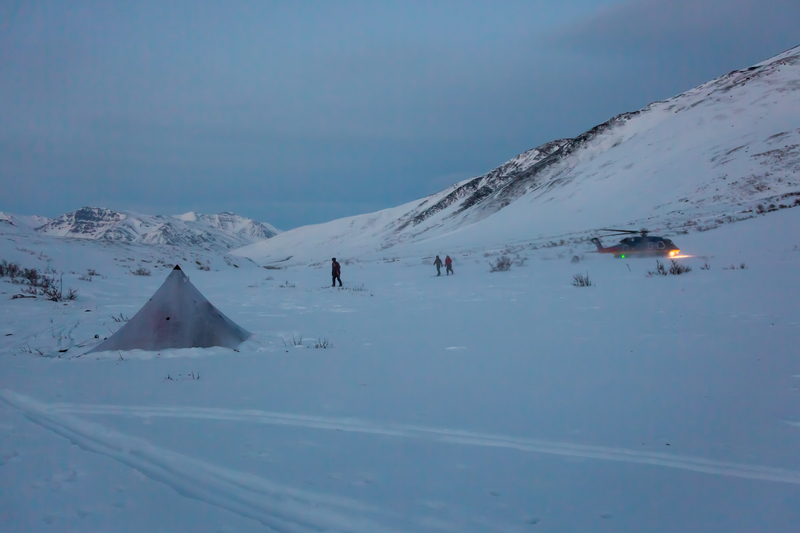 The slow travel, combined with an early camp after the avalanche accident, and the extra time it took to find a safe route over the divide, put us well behind the 2017 pace to reach Wiseman Saturday or Sunday. As we continued down valley, we discussed the option of exiting to Arctic Village, a cool destination that would shave ~60 miles off of our route. Snow conditions improved as we continued down the Wind River valley, to the point where we started discussing heading toward Wiseman. We put the decision off until the final decision point. The decision ended up being an easy one. 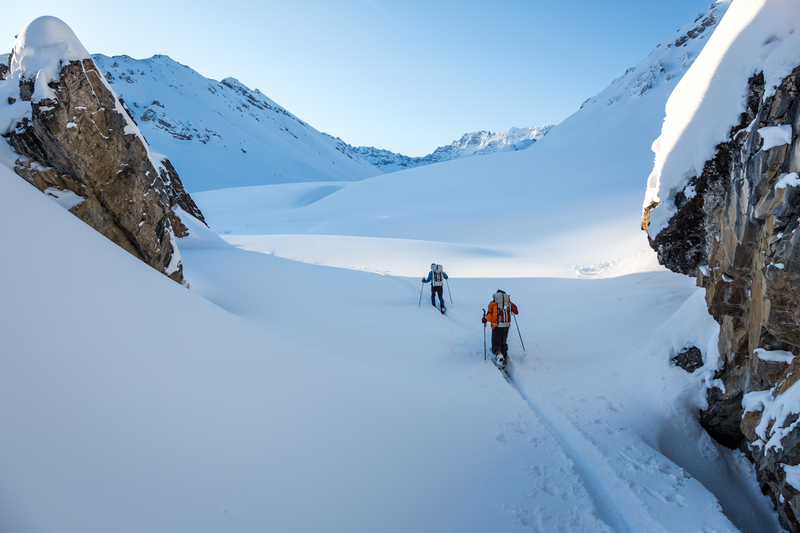 We were a full day behind the 2017 pace, and the Wiseman route would involve four passes, two of which we might have to tip-toe through, given the poor avalanche stability. Chuck had a strong preference for Arctic Village (he was the only one of our group that had done the established route), and since he was doing most of the trail breaking, we were all pretty easily persuaded (this part of the trip was called “Chilkoot Chuck and the Feeble Five”). 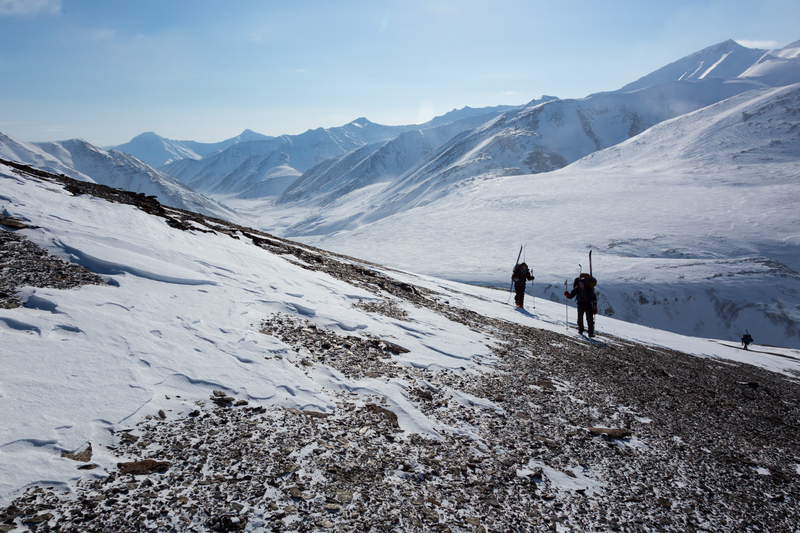 The route to Arctic Village brought us through a broad pass, no avalanche exposure, and close enough to some rocky peaks to keep the terrain interesting. But the snow was deep and faceted, a chore for the trail breaker. 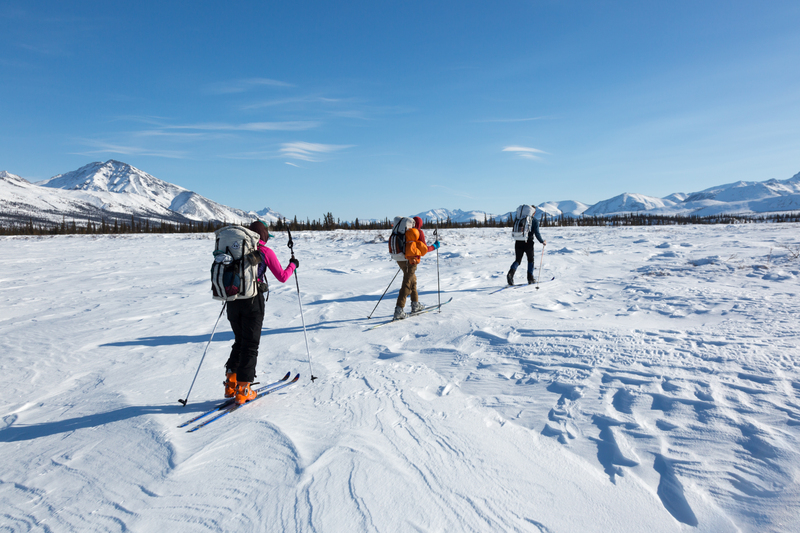 We followed caribou trails whenever possible, “meanders on meanders.” The scenery improved at Smoke Creek, and we found a few nice sections of ice to double pole. 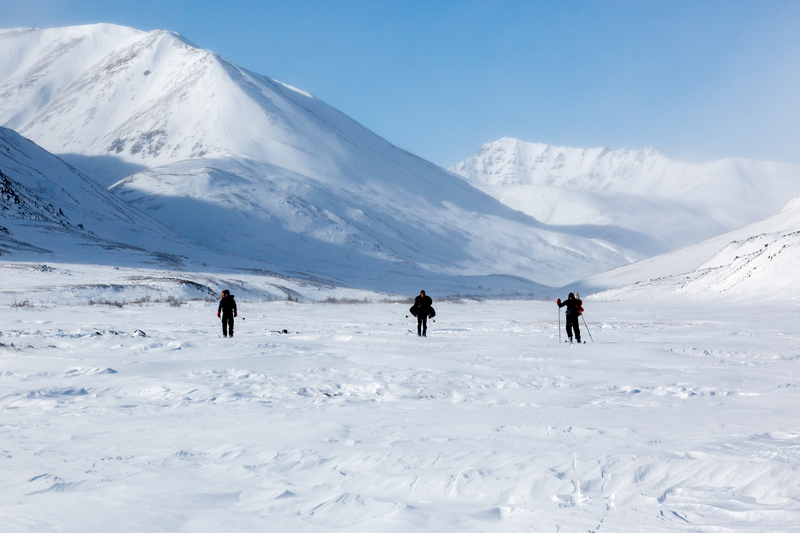 We reached the Chandalar River and continued to slog through deep snow. 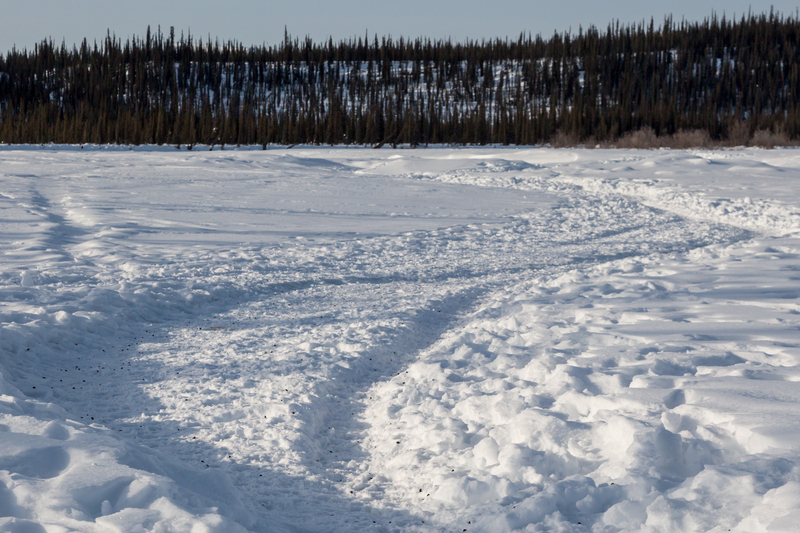 At points the caribou tracks converged into a major highway, but we only found one caribou trail that was straight. Sarah said that was a drunk caribou. 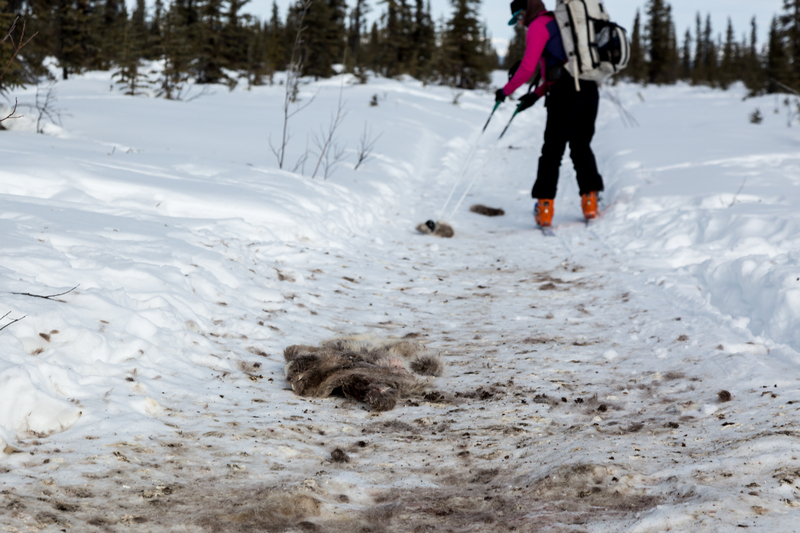 On Saturday afternoon, 8 miles from Arctic Village and starting our 7th day on the course, we found a snowmachine track further trampled by caribou. 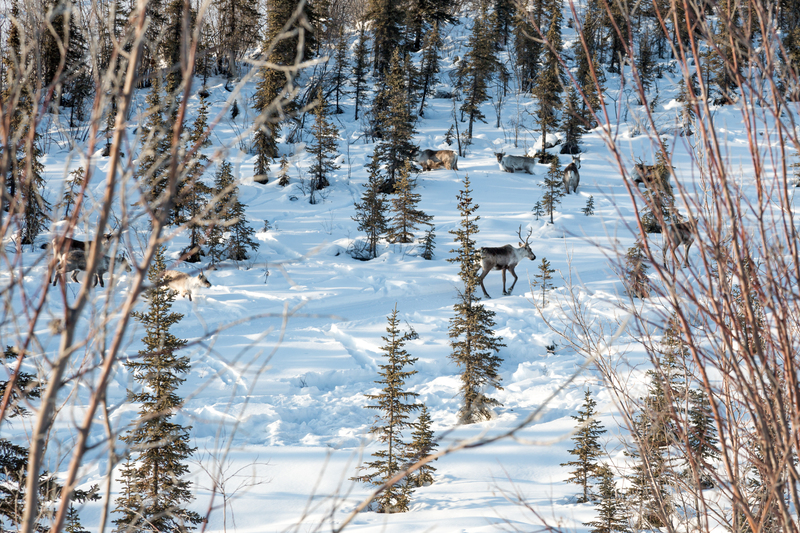 Eben said that was a smart hunting strategy… put in a track so that the caribou walk into town. They did! We saw the most caribou of the trip right in town. They weren’t all that lucky, there was a (presumably) wolf-kill on the track. 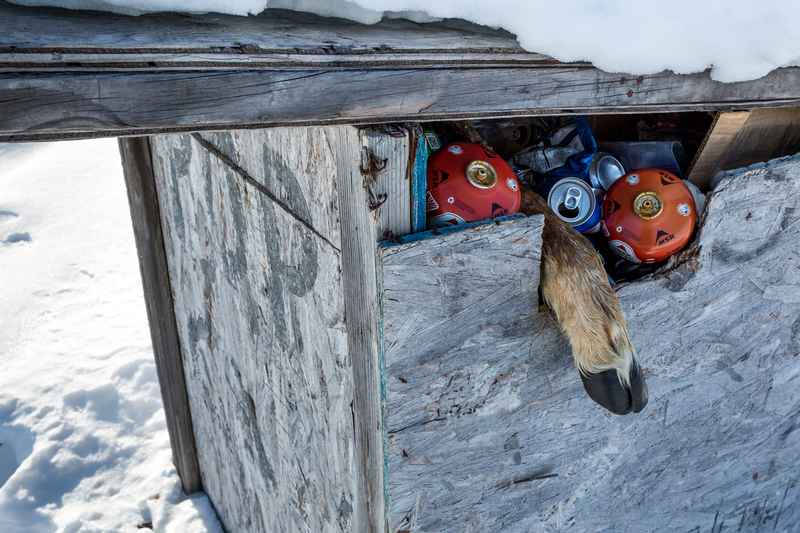 We received a very warm welcome in Arctic Village, probably the warmest I’ve ever received. 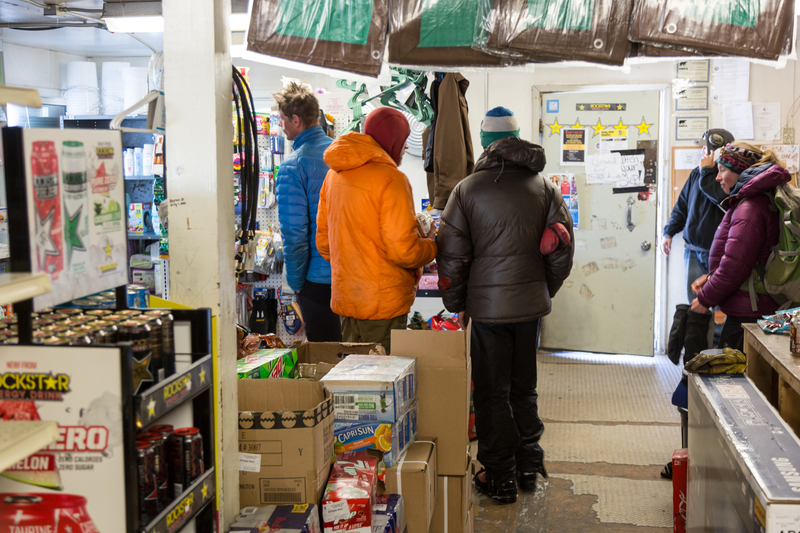 We stopped in at the grocery store and they suggested we sleep in the community hall, then tracked down a key, unlocked the hall and started a fire. A guy on the street stopped to chat, Daniel, and he said we should play radio bingo that night. He dropped off a radio and we followed along as the organizer tried to find enough players. At 12 players, she asked for a runner, someone that would deliver boards to us. 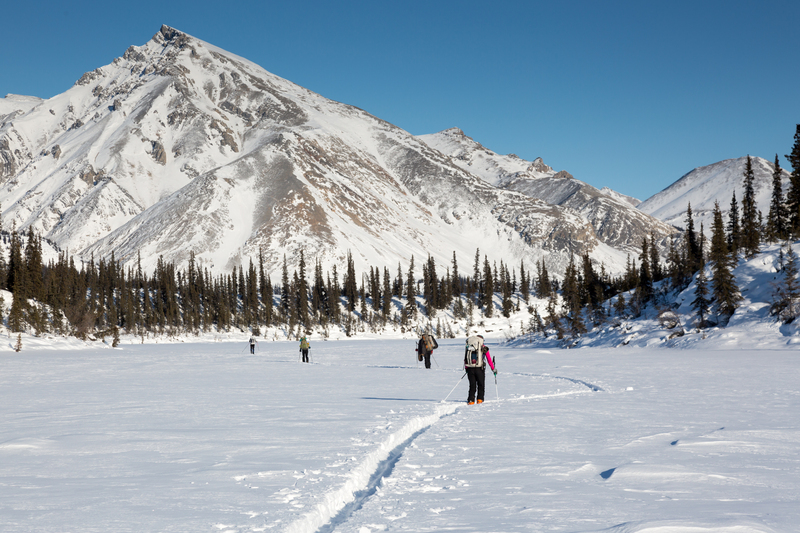 The radio was silent for awhile, and then the runner apologized, “Snogo no-go! Maybe the spark plugs?” Without a runner the game was cancelled, which was fine with us since we were having trouble staying awake since 9 PM. We weren’t able to fly out until Monday, so we spent the days exploring Arctic Village and eating ramen and frozen pizza from the store. 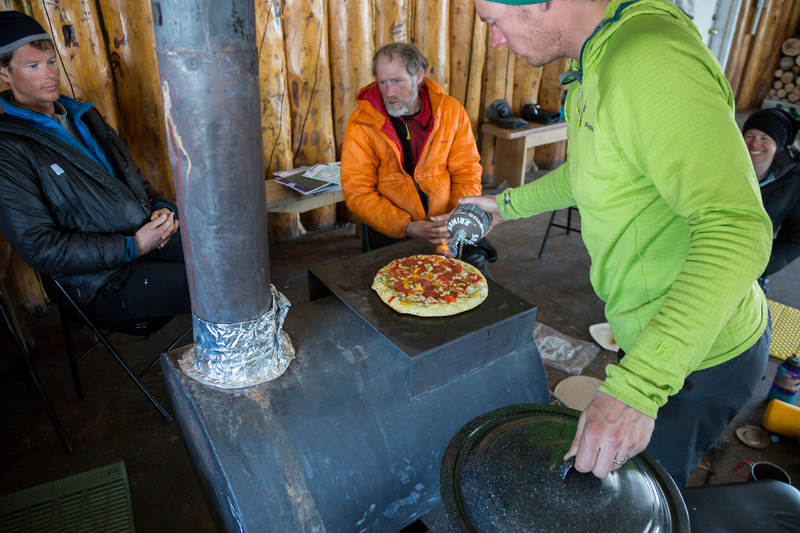 Eben was the master pizza chef, cooking pizzas in and on the wood stove. 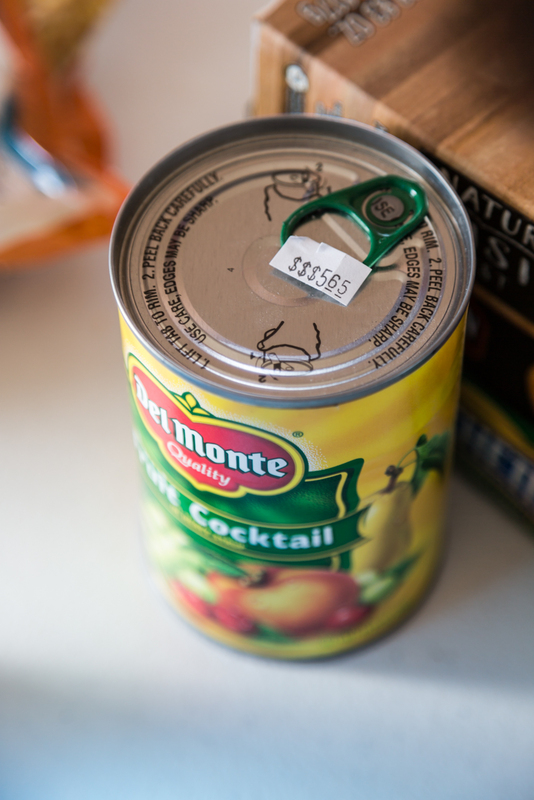 My guilty pleasure was a $5.65 can of fruit cocktail, dessert of my childhood. 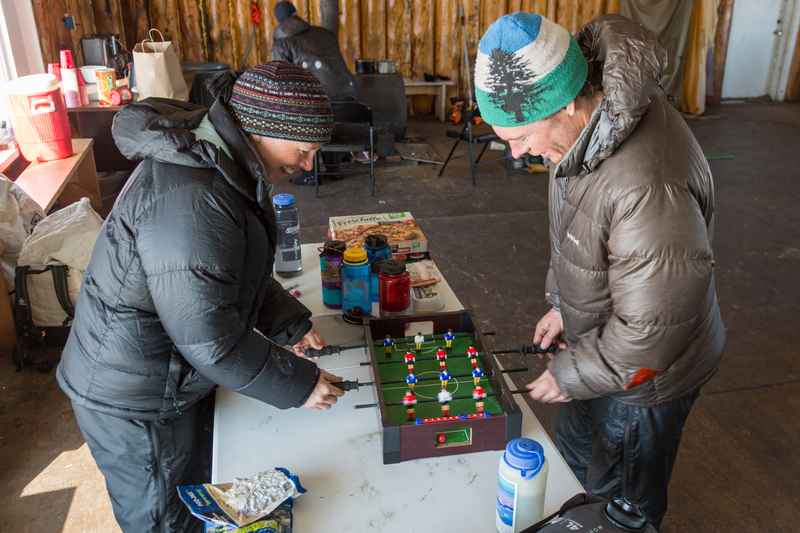 We also found a mini foosball table in the dump, and used atomic fireball candy to play. I was surprised by how different the Gwich’in Athabaskan seemed from the Upper Kuskokwim Athabaskan that I grew up with in McGrath. 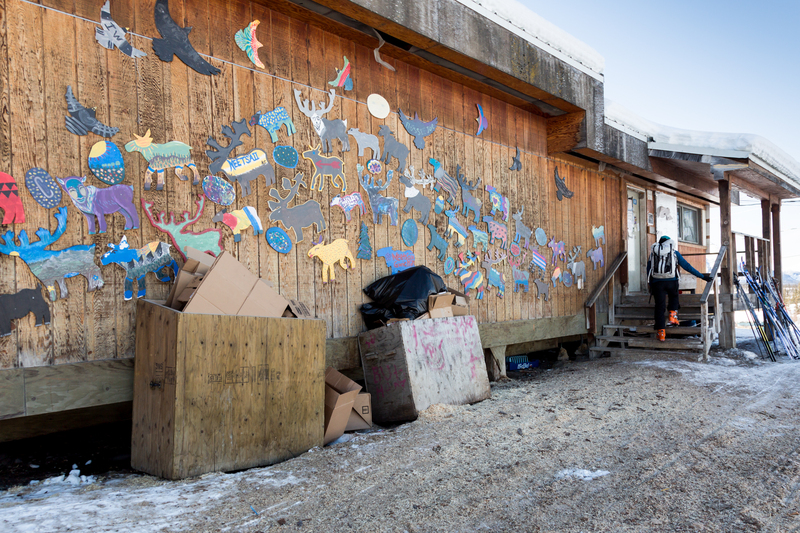 I think the main difference was how large a role caribou play for the Gwich’in, ‘Caribou People.’ We saw teepee-like structures that I assume get wrapped in caribou hides, antlers, caribou parts, and of course, caribou, right in town. It was surprising to hear locals so outspoken about conservation and preservation of traditional hunting grounds. It was disappointing not to finish the Classic. Between the training and hard days, it would have felt nice to have another finish. But I like these “that’s a hell of a scratch” finishes too. I was impressed when guys ended up scratching to Cordova on the Thompson Pass to McCarthy summer route, and this felt similar. 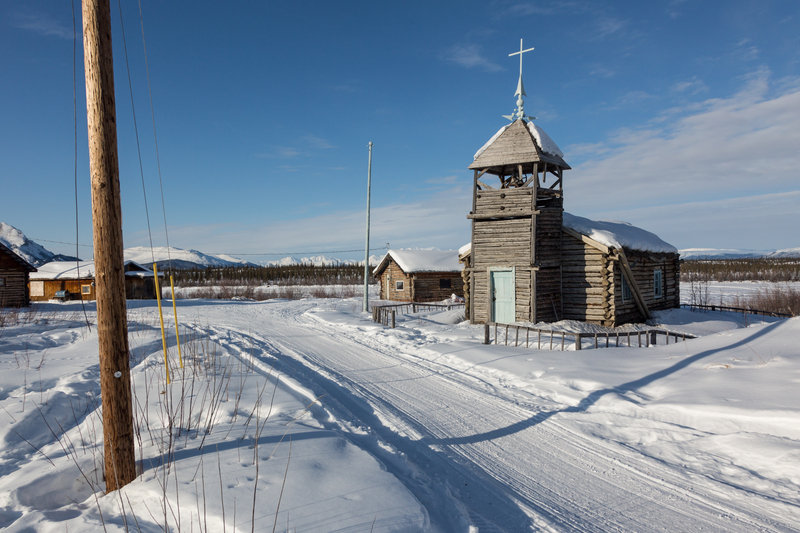 Getting to Arctic Village still took longer than any of my previous winter classics, and I think it would have taken 2 or 3 more days if we had stayed on route to Wiseman. Sarah and I had a great dynamic, and it was a treat to travel with Eben and Josh, two of my best friends and common trip partners. 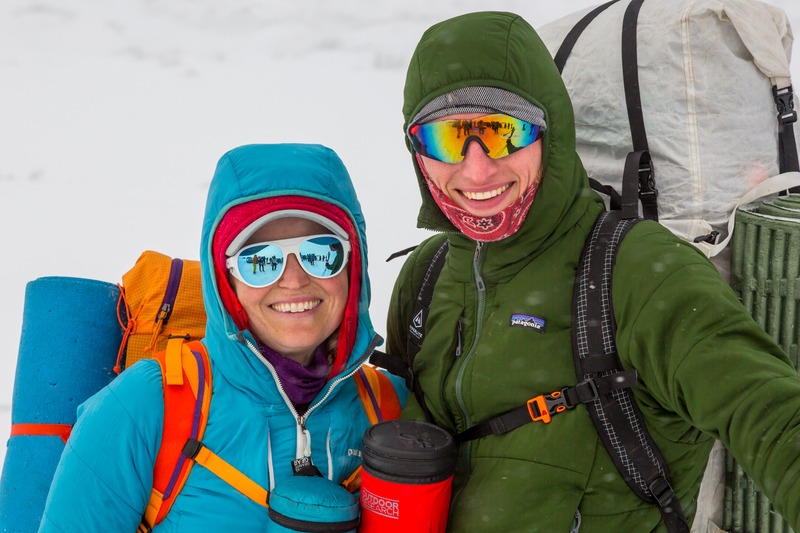 We are heading back out, with Natalie, for a spring trip in the Wrangell Mountains. We will miss Chuck’s trailbreaking!